The set comes in a cardboard box with a photo of finished model, built and painted by Miguel Jimenez himself. Inside a box we get instruction sheet with several more photos of Miguel's excellent T-55, which are a great reference for painting and detailing the model. On the box we find information that the set contains the engine parts licensed from Calibre35 company. But what we get in the kit is not the same product as the one that can be bought from Calibre35 - engine parts were modified, so now they show engine damaged by fire, not an operational unit. 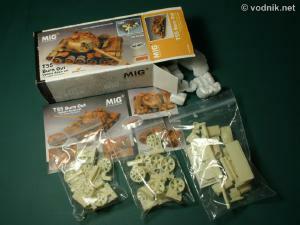 All cream resin parts in the MIG set are packed in three zip-bags and the box is filled with styrofoam chips to protect them from damage. Small instruction sheet is printed on a high quality smooth paper in full color. On one side of it are mentioned photos of finished model and on the other side are photos of unpainted resin parts attached to Tamiya model with numbers allowing for easy identification of each shown part. The set is comprised of 35 resin parts and 20 of them are burned road wheels without tires. Next seven parts make up an engine compartment with damaged powerpack inside and compartment covers. We also get four oil and fuel tanks, all bent and deformed by heat. There is also damaged searchlight without a glass lens provided. Last three parts are gun mantlet without dirt cover, the internal support part for it, and finally a gun barrel without a fume extractor. 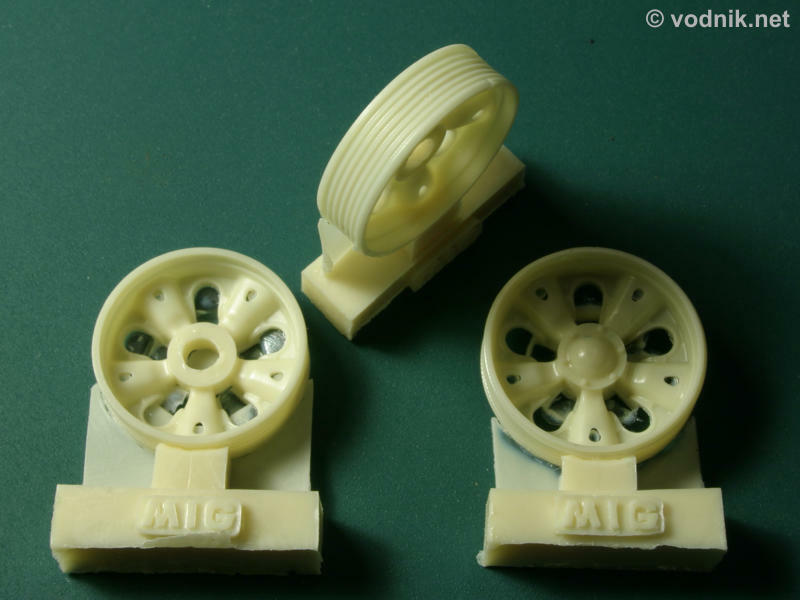 Gun mantlet parts may be familiar to some modelers, as they are available from MIG separately as the set number MP35-050. Click on picture to enlarge it. 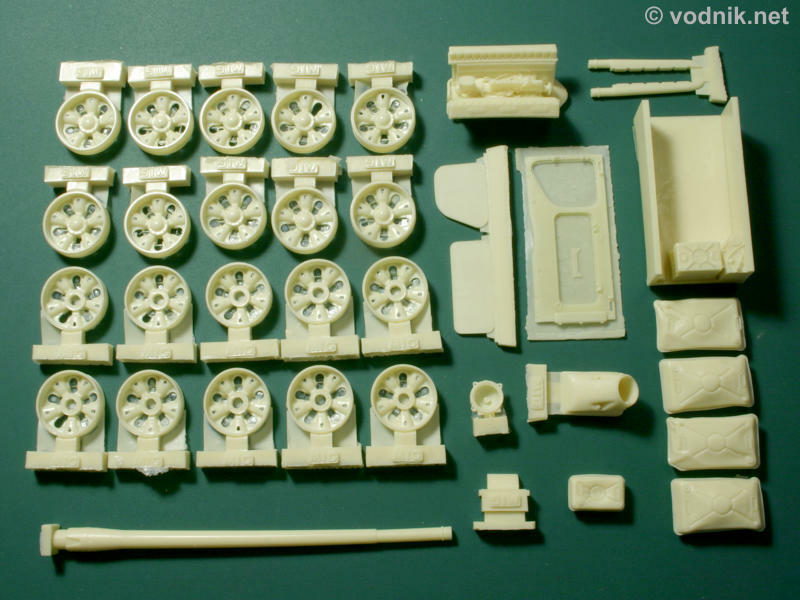 All resin parts. Two sides of instruction sheet. 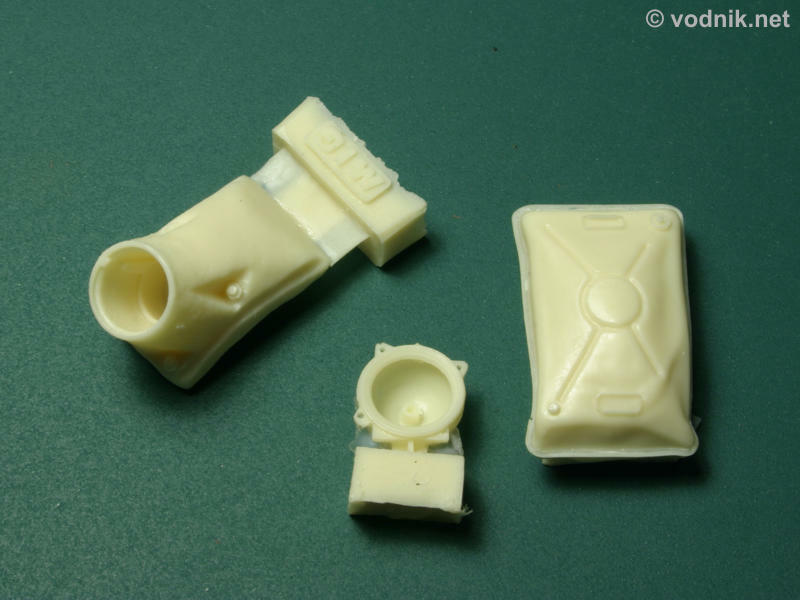 Resin parts are very well molded. Only on wheel parts I found numerous air bubbles and flash. Most air bubbles should be easy to fill and the rest should be simple to hide with heavy weathering, which is required in this case to make the model look realistic. Flash in the wheels is almost inevitable in this kind of resin parts and it is easy to remove. Fuel tank part have very thin weld lines / rims around them and these delicate strips of resin were partially separated from main resin parts in a few places. I didn't have any problems however to fix this by liberal application of thin super glue along the rim. Most parts in the set should be quite easy to separate from resin pouring blocks, but there are some parts with could cause some problems. For example engine compartment top cover is cast on a thin resin film, which has to be sanded off. There is also one other small part on the same film, which has to be freed from it by sanding. Compartment walls and floor part is molded with a lot of excess resin on the bottom and there is also no other way to get rid of it but sanding. 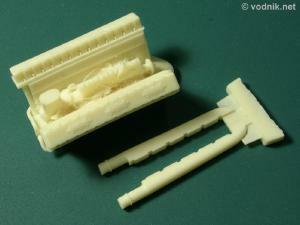 Some of engine parts licensed from Calibre35. Click on picture to enlarge it. Gun mantlet, searchlight and fuel tank. Unfortunately I do not have Tamiya T-55 kit (yet?... ), so I was not able to test fit resin parts to the kit. 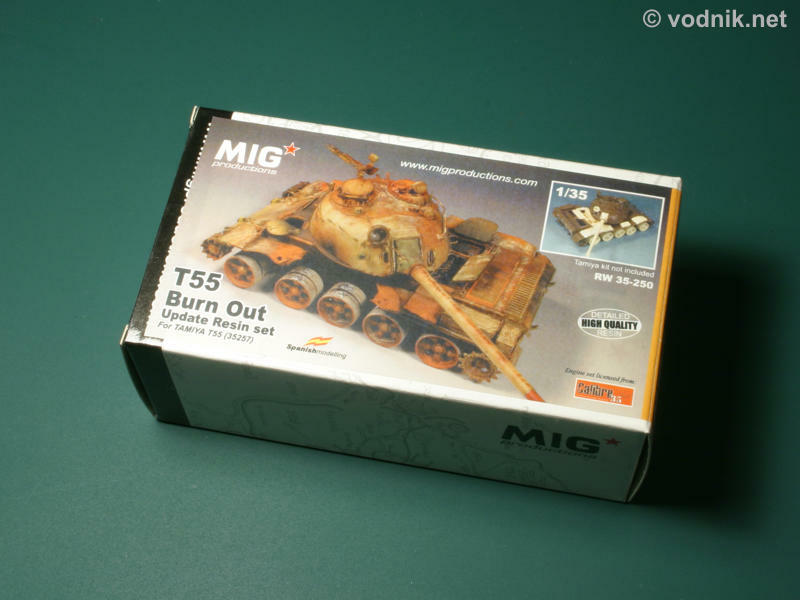 The only problem I see with this MIG Productions set is that you need to sacrifice Tamiya T-55 model to use it. For some modelers it can be too difficult (both financially and emotionally) to buy this excellent and expensive kit and then turn it into a wreck. Of course once finished and properly weathered such model can be a centerpiece of a diorama and in many aspects be more interesting than many "operating conditions" tank models. 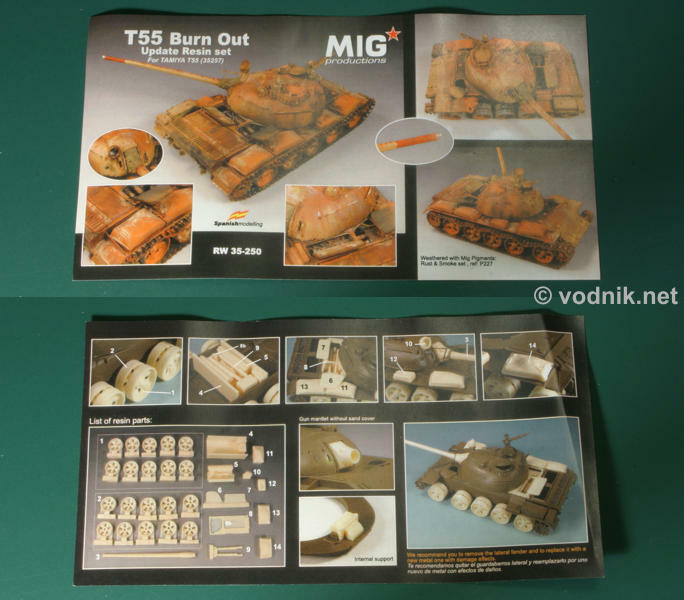 So if you are ready to use Tamiya T-55 to build a replica of destroyed tank, you won't find a better product than MIG Productions set to help you achieve this goal. Recommended! Many thanks to MIG Productions for the review sample!